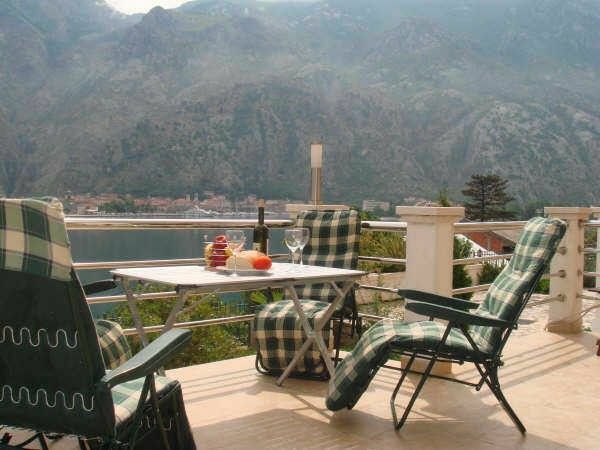 This large beautiful apartment has breath taking views across Kotor Bay. This brand new ground floor apartment is in Muo - a picturesque fishing village a stone's throw away from the spectacular medieval walled town of Kotor. The apartment modern, bright and airy with one of the largest balcony (30 ft x 12 ft) on the bay, offering panoramic views over the fjord, mountains and old town of Kotor. There are floor to ceiling bay windows throughout the apartment with wonderful views across the bay. The apartment has been built to high standards and fully furnished. The apartment is fitted with all mod con utilities, a flat screen TV, DVD player with USB key, wireless broadband, satellite TV, Hi-Fi system with ability to connect MP3/Smartphone, and cold & hot air-conditioning. This is arguably one of the most gorgeous looking buildings on the bay with only a 3 min walk to the bay and is not on a steep hill compared to some other complexes. With hammocks on the balcony, this place is ideal for relaxing and absorbing the view. Walk straight from your front room or your master bedroom onto the balcony overlooking the high cliffs and rugged mountains. Easy access to the pool straight from your balcony is also a plus - the beauty & view from your apartment of the bay has to be seen to be believed. Lovely place. Nice facilities. Pool was fab. I stayed in many places around Kotor bay in the past, and this appartement is one of the best. We were a family of 5 and the size of the appartment was perfect, clean, well equiped, perfect distance from Kotor. Stunning views - what a place! What a holiday! Apartment is awesome and exactly as described with breath-taking views, better than any pictures could do it justice! Apartment was clean, modern and big enough for 4-5 people comfortably. Parking is a bonus for those that want to rent a car and explore. Parking around the bay is straightforward, although we were there at the start of the season. The spot is beautiful, with easy access to all restaurants and bars - old town is a 15 min walk or a couple of euros in a cab which are easy to come by. It is refreshingly untouched by commercial tourism and still retains all of the historic charm while offering all of the amenities you could require. From booking to check out, the owners and management company were on hand for any information/needs. Would not hesitate to recommend booking this place, although.......do not follow the Sat Nav over the mountain road from Podgorica - take the coast road!!! the apartment looks as described. We are a family of 4 with 2 teenagers and muo/kotor was perfect for us. The apartment was simply brilliant, twin and double rooms with 2 showers was really useful. The view is quite amazing and a vey spacious balcony which was bigger than all the neighbouring ones. To wake up and see kotor across the bay was very special. Mark could not have been more helpful. He gave us so much help and advice during our planning and preparations and always got back to us by promptly. His taxi guy he recommended was very reliable and worth using if you need it. Kotor is a special place and we lived montengro, made special by this apartment, it's location, view and mark the owner. You don't need a car but we explored lake skadar for a couple of days which was amazing so would need a car for that. But at 45 euros a day from a local guy it was great. Don't listen to uk gov advice about needing an international driving licence, the local hire people don't care! Pool is great, small but perfect and it was not very busy when we were there. Food to is quite cheap lovely coffee at 1.50 euros. Swimming in the bay is also very close but they're are many other spots around the bay you can take a dip from. You will not be disappointed by this apartment and Muo. We had a brilliant time. Brilliant apartment with lots of great extras ( we needed the umbrella while we were there) nice and clean, lots of seating and the owners are very helpful, quick to return your emails and queries, best apartment we have stayed in and struggling to find somewhere to match up to this so it looks like we will be booking again for 2015! From your balcony look across to Kotor Old Town & harbour across the bay (10 mins walk), & listen to the Cathedral bells chime on the wind. Only a 3mins walk to the road leading to Old Town, which is great compared to other steep apartments on hills. Watch the boats & cruise liners reach the very furthest point of the fjord. Look along the fjord for a view you will photograph many times as the light of day constantly changes. Great for people watching as the locals fish & come and go below you. By night, watch the Old Town castle wall lights light up over the mountain tops. The Boka Kotorska bay is fascinating, providing many miles of driving/walking around the fjord until you reach the open Adriatic Sea. Around the fjord are many interesting fishing villages and along the nearby Adriatic coast are the beach towns of Dubrovnik and Budva. The coastline is spectacular and offers a variety of beaches within easy driving range and, if the seaside tires, visit Montenegro’s famous mountains and Europe’s deepest canyon!